Mythology – a heady mix of passion, devotion and tradition has always appealed me. From early childhood, I am quite smitten with this delectable mix of fiction and fantasy. 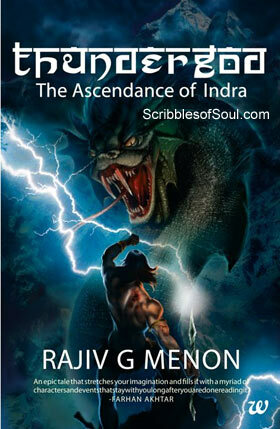 So, I practically jumped up with joy when Amazon gave me a chance to freely download an e book called Thundergod : Ascendance of Indra written by Rajiv G. Menon published by Westland. Indra is one of the most popular God of Indian Mythology. He is the Lord of Heaven, thunder and rain, is considered quite amorous and is well known to take offense at anyone who tries to become more powerful than him. But, despite listening to tens of stories featuring Indra, I was till now oblivious of his parentage and family background. Almost all the stories I had read focused on the Lord Indra, who is powerful and meek at the same time. None of them explained his insecurities or strange snooty behaviour. So, I was quite excited to read his story from the very beginning. But, as I begun reading Thundergod by Rajiv Menon, I was dumbfounded. The story began with a strange omen experienced by a meditating Rishi, interspersed with fighting scenes. As Daeyus fought with tribal and indulged in physical intimacy with Gaia and the Goddess of Susa paraded in all her naked glory, I kept wondering have I made a wrong choice? In sharp contrast to the usual moralistic mythical stories, here was a book focusing on the sensuousness of mortals and Goddesses and I had a heady feeling of reading a mild erotica rather than the mythical tale of Indra. However, contrary to popular saying, first impression did not last long. And, thus a story that began on a wobbly ground of amorous escapades, slowly established itself in the firm ground of myth and tradition. Slowly, I was initiated into the history of Pre Aryan times, rife with battles amongst various indigenous tribes. Thundergod is subtitled as Ascendance of Indra, though, the first few pages concentrated on the valour of Daeyus so much that I almost forgot Indra was the supposed hero. Rajiv Menon’s superb narration overpowered all my apprehensions and, before I knew I was immersed headlong into the battlefield of Devas fighting tooth for nail with the mighty Elamites. As the heroic Daeyus fought with formidable Elamites, his clan gained foothold in the hilly range of Aryavart with Indra being reared by his surrogate mother Mahisi and the heroic Mitra of Aditya clan. At the birth of Indra, it was prophesied that he is the One who would unite the four fighting clans of Northern tribes – Adityas, Devas, Yavnas and Ishvakus. Actually the prophecy was uttered by Kashyap hundreds of years ago, when he married two tribal women Diti and Aditi and produced five sons. Aditi’s sons became tribal lords of Northern area, while Diti’s only son Asura remained in Kasyap’s shadow. However, a few years down the line, Asura was enamored by a woman, and he banished his father. Enraged Kashyap cursed his favorite son with decimation at the hands of a Deva descendent, who will unite the four Northern tribes and establish a divine kingdom. In the present time, Indra is supposedly that promised son. However, initially, he is unaware of his powers and destiny. As he grows up under the able tutelage of Mitra, he behaves like an ordinary boy. In the fashion suited to a warrior Prince, he is keen on forming his own band of army with his trusted friends – Vayu, Agni, Varuna and Soma. Indra trains himself to win friendly spardhas and is neither interested nor aware of his destiny of being a conquer of World. But, Mitra is well aware of his disciple’s potential and is slowly preparing him for his destined role. In the meantime, the story continued as a common political drama, with the Regent’s ambitious son trying to outdo Indra and with Mitra clearing Indra’s path to throne by securing Sachi, Regent Vasu’s daughter as his wife. Till this point, though nothing mythical or magical had happened, I was quite enjoying this strange concoction of politics and action. Rajiv excelled in fighting sequences. Though I am not an action movie aficionado, but I do enjoy the off beat ones like Gladiator or Troy. And, here I had almost the same experience. Menon recreated archaic settings complete with maces, swords and duels, and I quite loved to read the elaborate battle scenes. Had the story continued in this strain, I would have still loved it. But, remember, we are reading the story of a mythical God, and there has to be some extraordinary element of supernatural in it. So, in a well timed masterstroke, Rajiv introduced Pisachas, Yakshas and Gandharvas, transforming the ordinary political drama into a fast paced celestial saga. All of a sudden, Indra and his friends experience a unique brush with divinity. They are bathed in heavenly light and given supernatural powers. And, now, I could see the Lord Indra with all his paraphernalia as I have often read in Puranic tales, complete with his associates Vayu, Agni, Varuna and Soma. As I always knew these names as Gods, this strange transformation from mere mortals to divine beings was a unique experience for me, something none of the other stories ever cared to explain. Rajiv dealt with this particular episode quite dexterously. His protagonists are not converted into Gods instantly, but rather in the fashion of Spider-man, they slowly comprehend their powers, struggling to control their newly found abilities. For me, this was the best part of the story. It opened a whole new world of fantasy, and I did not blink once while reading Indra’s heroic conquers over Pishachas, Auras and Danvas. The short summary I have given is just the tip of the iceberg, as even after completing the entire book, I was stunned by the climax, goading me to read more! I feel the biggest challenge in retelling a mythical story is that the author has a very limited space to experiment. As the story is well known, he can not drastically change facts and is still required to bring novelty in the narration. Rajiv G. Menon has totally nailed this dilemma. He has created a powerful character in such a progressive way that I could not dare disbelieve Indra’s super powers. He appears vulnerable in his love to Sachi and Valli, and yet is ruthless while dealing with Asuras and Harappans. He shows constraint in inflicting cruelty over war prisoners, yet is pitiless while devouring the heart of a fallen enemy. In short, Indra and his motley friends looked equally at ease with divine powers and bawdy debauchery. But, despite my heartfelt appreciation for the well written book, I did not like the excessive use of carnal scenes. The extensive physicality may help a writer to grab eyeballs and enhance readership, but, I think, Rajiv’s writing prowess and exquisite narration does not require such cheap gimmicks. Another small irritant was the slight Western influence I noticed in the narration. The Hindi and Sanskrit words were painstakingly avoided, at least initially. The writer tried hard to give English meaning of common words like Roti and Spardha. I noticed this trend in V. S. Naipaul’s work as well. Somehow, Indians shy away from using their native language, though, its judicial use can only enhance the regional appeal. However, as the story progressed, unlike Naipaul, Menon rectified himself. He later introduced Hindi words comfortably, letting the meaning being described with lucid explanation instead of literal translation. Other than these slight niggles, I absolutely loved this book. My only ruse is that it is a trilogy. The present book has ended on a curious note, and I am damn excited to read more. But, given my impulsive nature, I can not say for sure whether I would ever continue or will this trilogy be also stopped at level one like Immortals of Meluha and Emperor’s Edge! When I had read Maneater of Malgudi, I was impressed with Narayan’s unique take on the story of Bhasmasura. As I read Great Indian Novel, I was surprised by Shashi Tharoor’s ingenuity in moulding the traditional tale of Mahabharta to Indian modern politics. My love with myths and traditions continued with Immortals of Meluha, scaling ever new heights with Bulfinch’s Greek myths and Roman intrigues. But, Thundergod has left me hungry for more. He has opened a whole new world of Indian Mythology to me, interspersed with Norse myths, and has piqued my interest more than ever. All in all, a great debut by Rajiv G. Menon. A worthy read for everyone.